While reading submissions for our New Horizons show, we were delighted to come across the work of poet Anjela Villarreal Ratliff. Anjela’s poems explore a personal relationship with language and tell stories with every line. We’re looking forward to performing her poem “Dear español” April 11 at Cafe Stritch. Anjela is a graduate of San Jose State University. Her work has appeared in various publications, including Texas Poetry Calendar, Australian Latino Press, Chachalaca Review, Boundless, Pilgrimage Magazine, riverSedge: A Journal of Art and Literature; Bearing the Mask: Southwestern Persona Poems; Latinas: Protests and Struggles in the 21st Century USA; and is forthcoming in Southwestern American Literature—Women in the Southwest: From the Frontier to the Frontline; and Poems for the Tricentennial – A Poetic Legacy. She is also a creative writing workshop presenter. A native Tejana, Anjela was six months old when her migrant family moved to southern California where she was raised. She has lived in Austin, Texas, since 1990. Anjela has published several poetry chapbooks, including Jardín de Poesía and Entre Piedra y Sol. Some of her chapbooks have been archived at the Benson Latin American Collection at the University of Texas in Austin, and at Michigan State University Libraries Special Collections. 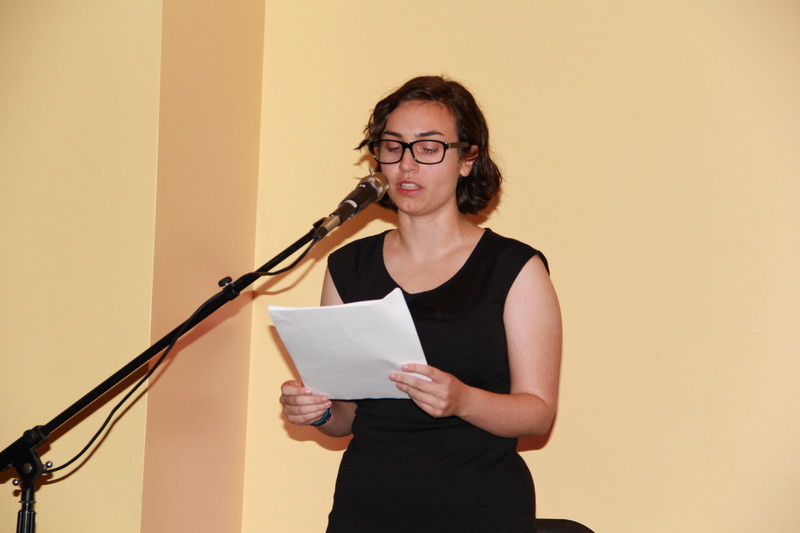 Her poem, “Merged Mundos,” was a winner in the San Antonio Tricentennial Poetry Contest. Her poem, “I Exist,” was animated by Francesca Talenti. Her short story, “In My Classroom,” was published in Chicken Soup for the Latino Soul. Several of her poems were winners of the Poetry With Wheels contest, for the Austin Metro area. Anjela was also editor for the Austin Poetry Society’s MuseLetter. Her artistic photos have been published in Pilgrimage and the San Pedro River Review. She was kind enough to answer a few questions about herself for us. I saw the recent call for submissions by Play on Words posted on Facebook; and since I am a former graduate of San Jose State University, it perked my interest right away. I was delighted by the idea that readers and performers from the San Jose area would be reading the selected works. I have been very inspired by numerous well-known poets, including Carmen Tafolla, Naomi Shihab Nye, Benjamin Alire Saenz, David Hernandez, Billy Collins, Mary Oliver, Sylvia Plath, Pablo Neruda, and Octavio Paz, to name just a few. I am continually inspired by the poetry of several talented Austin poets I am privileged to know personally: Gloria Amescua, Lydia Armendáriz, Liliana Valenzuela, and Celeste Guzman Mendoza. Name a book or performance that fundamentally affected you. I very much enjoy the performances by the gifted and multitalented, world-renowned poet/writer/performer, Dr. Carmen Tafolla, the 2012-2014 Poet Laureate of San Antonio, and Poet Laureate of Texas for 2015-2016. One of her earlier collections of poetry and prose, Sonnets to Human Beings and Other Selected Works, is one of my all time favorites by the Latina poet. She also performs a one-woman storytelling act, with an array of great characters, including “Tia Maria.” Every time I see her perform her literary works, I come away inspired and deeply moved. Intrigued? Join us at 7 pm next Wednesday, April 11 at San Jose’s Cafe Stritch to see her work performed aloud. Podcast alert! Our ninth episode is special because it features Ivette Deltoro and Erin Southard of the Mini Lights Emerging Artist program, Play On Words’ community partner. Listen to Ryan Alpers interview Ivette about performing “Thirty Pounds in Three Months” by Christine Stoddard at our January 17 show–and get the scoop on Mini Lights, a new series in San Jose designed to support young theatre professionals as they learn to cast, direct, fundraise, and market their own productions. Pretty amazing, right? Listen to this special episode on SoundCloud or subscribe, rate and review in iTunes. Mini Lights’ first show, “boom” by Peter Sinn Nachtrieb, debuts next Thursday, February 22, at City Lights Theatre in San Jose. Directed by POW co-founder and casting director Melinda Marks, it features Play On Words cast members April Culver and Michael Weiland. In other words: this is a show you won’t want to miss. Tickets are on sale here. Speaking of great art: Play On Words is currently seeking short works of fiction, nonfiction, theatre and poetry for our April 11th show. We want to read your work! Email us submissions at playonwordssj@gmail.com. Today on the podcast, host Ryan Alpers interviews POW founders Melinda Marks and Julia Halprin Jackson. They discuss Play On Words’ origin story, their collaboration with San Jose’s Flash Fiction Forum, and the benefits of hearing one’s work performed aloud by an actor. Listen to the episode on SoundCloud and subscribe, rate and review on iTunes! Yes, you’re reading that right: You could be lucky enough to score discounted tickets to “The End of Time.” Intrigued? 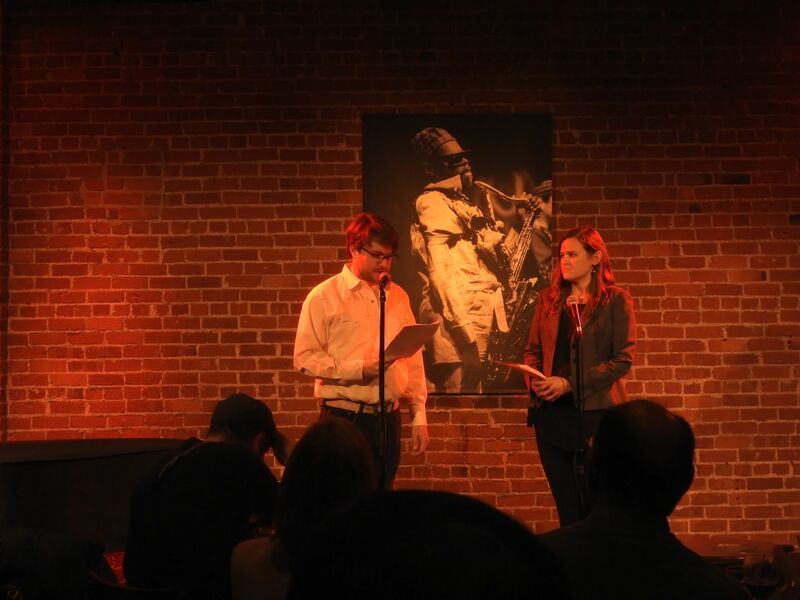 Ryan Alpers and Julia Halprin Jackson read the prologue to “The End of Time” by Cellista at Cafe Strtich, January 6, 2016. Photo by Leo Alvarez. Last week, at New Year Nouveau, we performed an excerpt of a piece written by Freya Seeburger (Cellista), a professional cellist, entrepreneur and performer based in San Jose. We were drawn to this piece because of its historical significance–it introduces the story of the “Quatuor pour la fin du Temps,” a historic quartet composed by Olivier Messiaen while held captive in a Nazi prisoner of war camp in 1941. Ryan Alpers and Julia Halprin Jackson read an excerpt of Cellista’s introduction to this famous piece of music, which she will be performing with the Juxtapositions Chamber Ensemble on February 20, March 12 and 13 at San Jose’s Anno Domini gallery. 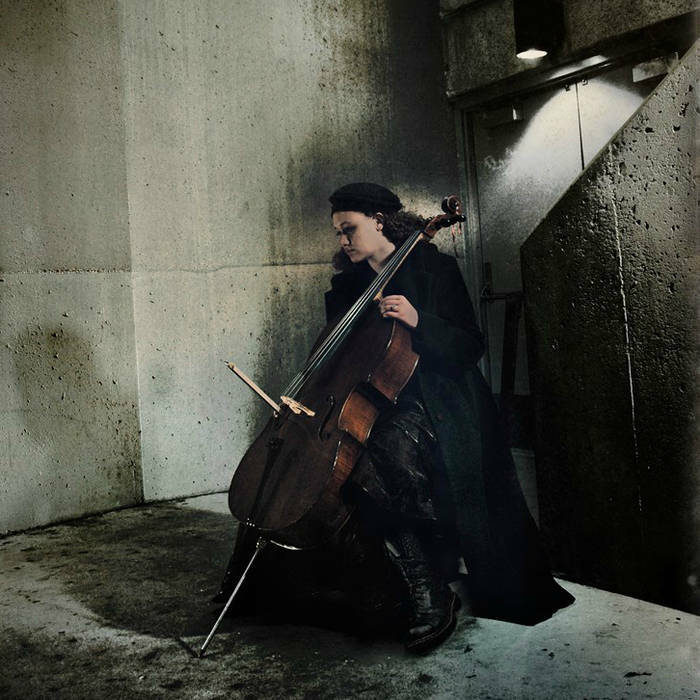 Why do we love Cellista’s work? In addition to being an accomplished musician, her performances tell stories. Freya often incorporates multimedia elements into her shows; she collaborates with amazing designers and artists, and through her work with Juxtapositions, creates opportunities for fellow working musicians. For the End of Time shows, she’ll be performing with violinist Ishtar Hernandez, clarinetist James Pytko, and pianist Naomi Stine. Not only that, but she invited American artist Barron Storey, publisher of Neil Gaiman’s Sandman Chronicles, to create artwork inspired by Messiaen. This original work will be on display at Anno Domini starting February 5. Also–you can now view the full footage of our January 6 show on South Bay Pulse’s YouTube channel. To see us perform an excerpt of Cellista’s work, watch Part II. We’ll be posting excerpts from this footage on the blog over the next month or two. Want to learn more about her work? Check out her blog to learn more about how she discovered Messiaen’s quartet, and why she feels that San Jose is the perfect place to perform his important work. Melinda Marks performs “Platonic Affairs” by Kirstin Chen, February 2014. Photo by Michelle Anderson. Melinda Marks is a theatrical force to be reckoned with. One of the founding members of Play On Words, Melinda has served as casting director, playwright, actress and promoter all in one. We’ve been lucky enough to see her work performed, both by herself and a cast of POW regulars. She performed her monologue, “Medes Infinitum,” at our October 2013 show, and her short play “Menage A Un” was a big hit at our February 2014 performance. As we gear up for our May 22 show (we’ll be announcing the lineup soon), we wanted to pick her brain about what it’s like performing for Play On Words. POW: What did it feel like to hear your work performed aloud at Play On Words? MM: It was great. My monologue was a very dramatic piece, and it was very private. It was a very different tone than anything I had attempted before. The fact that it was well-received, and that it was from an organization that I had just started with awesome, competent people, made the experience very supportive and very positive. I’m not the type of person who is naturally self-promoting. I like to promote organizations and I like to endorse things that I’m proud of. The fact that I was artistically part of something that I was collectively a part of made it a very positive experience. I was very surprised at how well it was received and I was also very grateful for the opportunity.I had only had one other place produced before my play was performed, and having it read and performed by friends who got it and got my sense of humor, made it a very supportive experience. Because there was so much trust, and because the people who performed it were prepared to push the humor and the absurdity of it forward as far as it could go–it made the experience very differently supportive, and very differently surprising. I think I’ll be surprised every time. 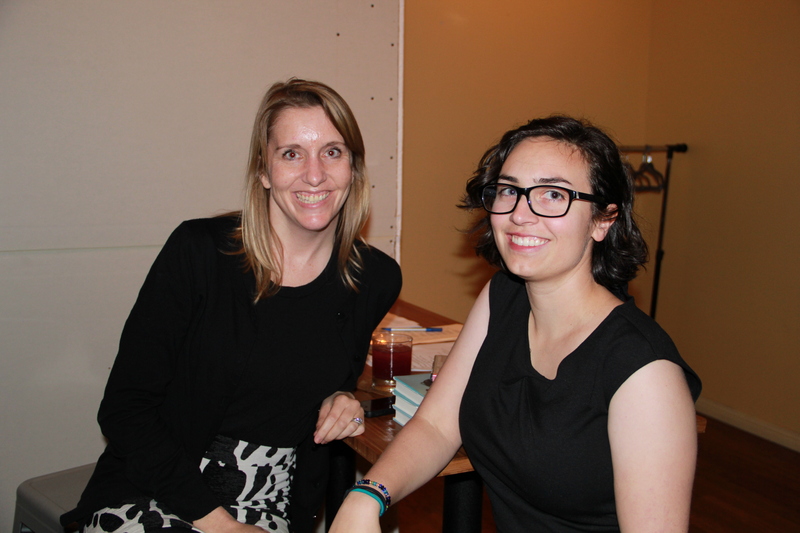 Melinda (right) with POW co-founder Nicole Hughes. Photo by Michelle Anderson. POW: You have also performed work written by other writers–notably, “Predecessors,” by Ryan Alpers, and an excerpt of Kirstin Chen’s new novel, Soy Sauce for Beginners. What was it like to read for writers who were in the room? MM: Awesome. It was really nice to feel so supported and to be able to support people like that, because I feel like I’m most comfortable showcasing other people and being proud of other people. It’s tough when you’re in a regular show to really show that, because you’re just doing what you’re supposed to do. It’s a show of good faith to be a part of an organization and to help found an organization that is giving that opportunity to people who need it. The highlight of my experiences performing others’ work were being able to read comedic pieces and promote pieces by friends who I think are very funny, and who have done that for me, but who don’t have a lot of outlets for that kind of stuff. There isn’t a lot of room to promote one-acts and theater of the absurd, so Play On Words has been a good opportunity for that. The other highlight was reading Kirstin Chen’s excerpt that she had edited for us [“Platonic Affairs”], because that was something on a scale that I had never done before, and the fact that she was so grateful and impressed, was really humbling. It surprised me in a good way; as a performer you like to be surprised, but it was very validating. Play On Words is not only unique, but we’re doing very well, and it’s an experience and a service that people actually want and don’t get very often. It was really, really nice, and I was really happy to do it. I wouldn’t have thought that I would be in that position, where somebody else on such a large scale was so impressed with that kind of service. It just really changes the way that you think about something, even if it’s an organization that you already believe in, and a medium that you already believe in. That kind of validation really changes your angle on things in a really positive way. Interview concluded. POW: Interview concluded. Thank you, Melinda! If you haven’t seen Melinda perform, be sure to join us at 7:30 pm on Thursday, May 22, at San Jose’s Blackbird Tavern. We’re still on the lookout for performers and actors who might be interested in auditioning for the show. Contact us at playonwordssj@gmail.com with a bio, headshot and resume if you’re interested. Stay tuned for the full lineup! Brian Van Winkle’s ten minute play (which he also starred in), “The Way I Picture it In My Head Is,” was a big hit at our February show. Brian is a recent graduate of Southern Oregon University in Ashland, Oregon where he received a Bachelor of Science in Theatre Arts with a minor in Shakespeare Studies. 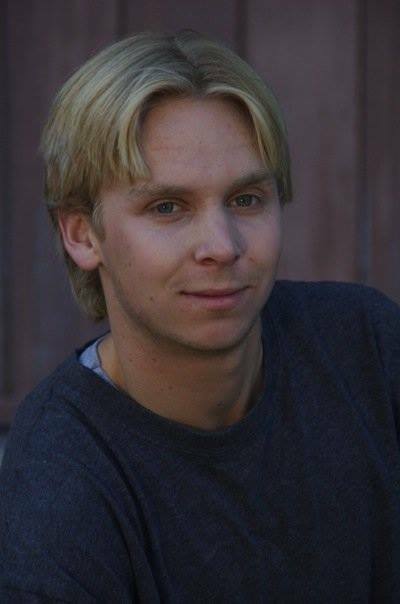 He is also a graduate of the Foothill Theatre Conservatory and a member of the Pacifica Table Readers. In addition to his play, Brian has performed at POW in Melinda Marks’ “Menage A Un” and Adam Magill’s one-act play “Malleus Maleficarum.” He agreed to share some thoughts with us on his writing and performance experience. POW: What did it feel like to have your words performed aloud? Was this the first time you saw someone interpret your work? What did you learn about your own writing? BVW: It has been such a privilege to have my work performed by Play on Words. Though this is not my first time having my work performed for an audience, the experience is always beneficial. There is no better way to improve one’s writing than to see how it is interpreted by other people. Seeing other people create something out what you have made allows you to take it in as a separate entity from yourself. You can see what in your piece works and what doesn’t based on how the audience reacts to it. There is little I can think of more thrilling and encouraging than when a desired reaction lands with a crowd just as you want it to–and if a certain idea is not coming through clear enough, it will become obvious by the way that it is portrayed. I am very grateful that there are outlets such as this so that new works can continually be developed and improved for aspiring artists. POW: What was it like to perform a piece knowing that the writer was in the room? How did you prepare? How did this experience make you feel about your own writing/creating process? BVW: It’s a pleasure to be able to give new writers a voice for their work. In an environment such as this, where we are able to interact directly with the authors, we are able to better prepare a piece in the way that it is intended to be performed. Being directly involved with the artists is a great way to help develop their work as well as gain skills to help hone one’s own abilities. Ryan Alpers has become a Play On Words regular. 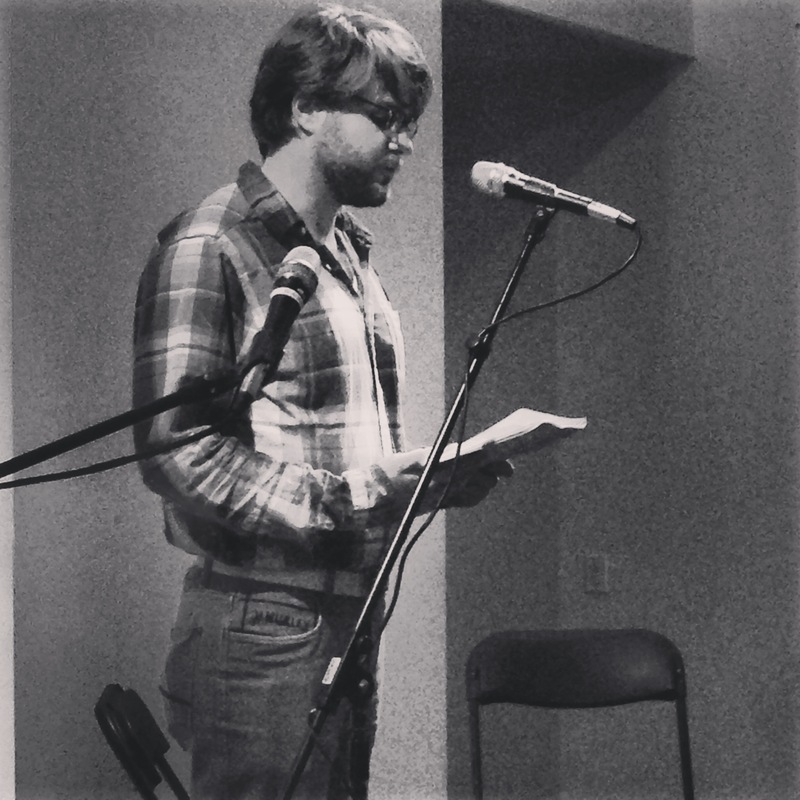 His short story “Predecessors” was performed at POW’s October premiere by Adam Magill and Melinda Marks, and that same night Ryan performed two poems by Eric Sneathen. His interpretation of Gary Singh’s poem “Here” at our February show has generated quite the buzz as well. We sat down with Ryan to compare the experience of hearing his own work read aloud to that of performing another writer’s work. RA: It was great hearing another interpretation of your work by actors. It gives you insight into your own prose and craft in a way feedback and group critique and friends and family and your dog/cat cannot. It is an honest look at your words through the eyes of another set of equally talented eyes. It’s also a great group of people. They’re nice and do this because they need to do it. San Jose needs it. You need it. I certainly needed it. My writing has only improved since. Ryan teaches high school English and runs the Lincoln High School newspaper, aptly called Lincoln Lion Tales. He has a B.A. in literature from the College of Creative Studies at the University of California, Santa Barbara, and a teaching credential from San Jose State University. While studying at the College of Creative Studies, he was published in the CCS Literary Magazine “Spectrum” and awarded the CCS Brancart-Richardson Award for fiction.